On inquiring about the route to the fort of Kavaledurga to a local, he replied saying, "Are you guys crazy to venture out there during these rains!? The path will be very slippery. 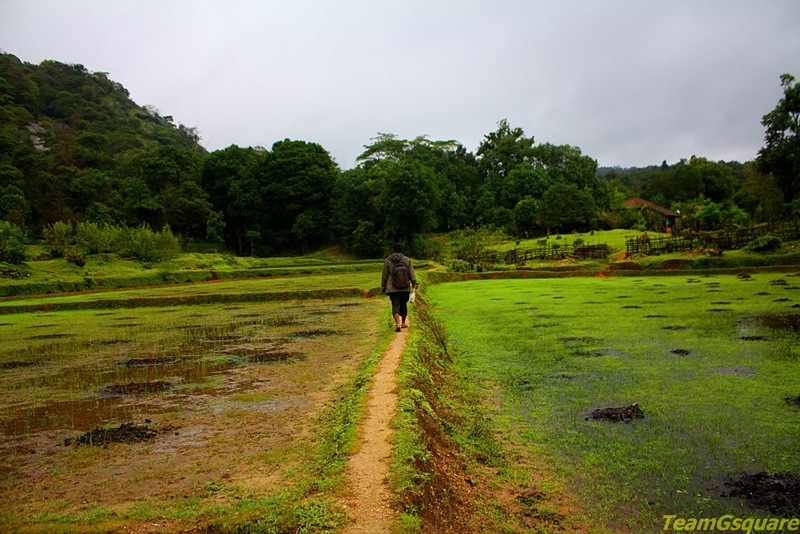 Go straight, walk along the field bund and you should reach the base of Kavaledurga". We nodded our heads and thanked him for the information and concern shown by him. We walked as per his directions and reached the end of the fields from where the path laid to the fort was visible. It was only when we laid our first steps did we realize we were in for something! 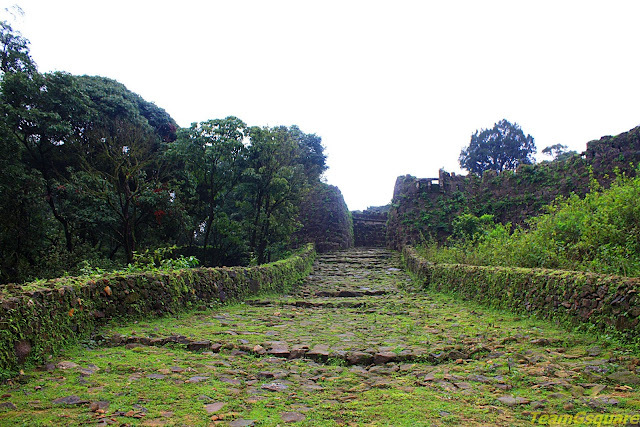 As we started our trek uphill on a very slippery slope, we noticed our steps almost matched that of a disco! We surely would have proved to be a tough competition to Micheal Jackson or Prabhu Deva. 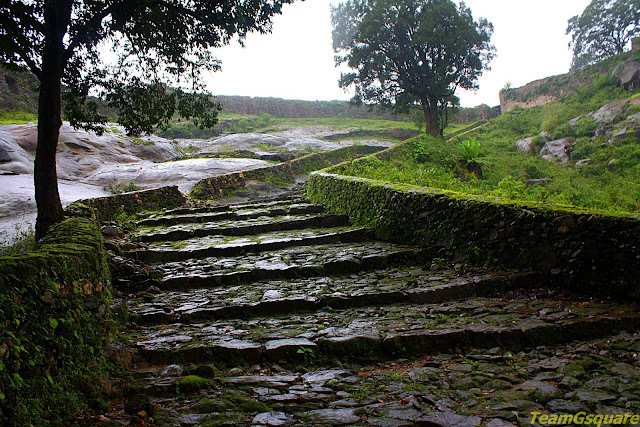 Even carefully laid steps with caution were slippery, and after slipping and trekking uphill for a good 40 minutes or so, we reached the second gateway of the fort from where the climb seemed easy and the views from here were mesmerizing. 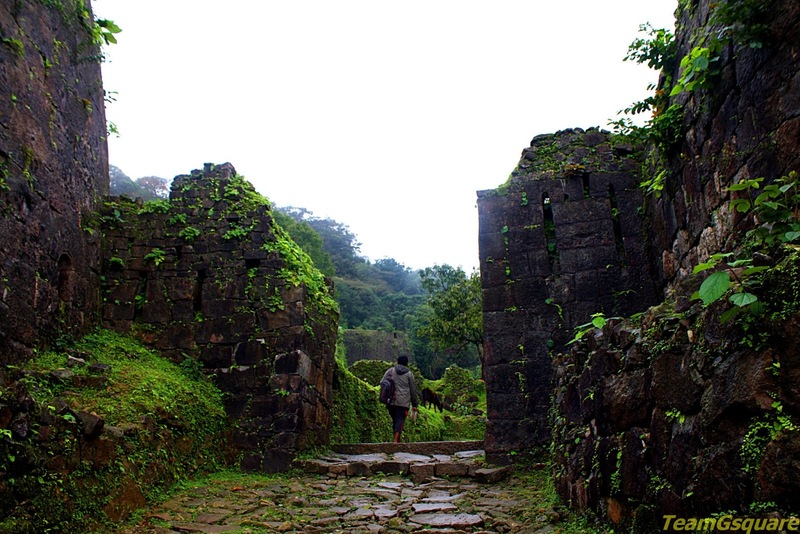 The history of Kavaledurga Kote (Fort) goes this way, "This place was also called as Bhuvanagiridurga owing its name to the temple of Goddess Bhuvaneshwari, which is located in the village and is of considerable antiquity. The fort was a stronghold of the Nayakas of Keladi, who fortified this hill post their liberation from the Vijayanagar kingdom. 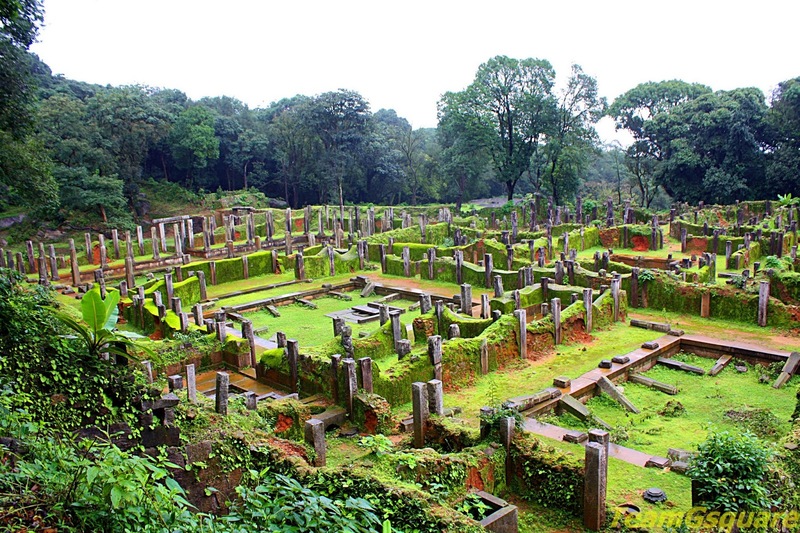 The credit of building this forest fort goes to King Venkatappa Nayaka, who also built a palace and village inside the fort walls. The fort is three tiered and surrounded by thick forests, which proves to be a perfect defense structure. Out of the many temples built inside this fort area, the three that have survived the test of time are the Kashi Vishwanath temple, Shikhareshwara temple and Lakshmi Narasimha temple. The Kashi Vishwanath temple is a beautiful structure and a unique one due to the presence of 2 dwajastambhas or stone pillars in front of the temple. 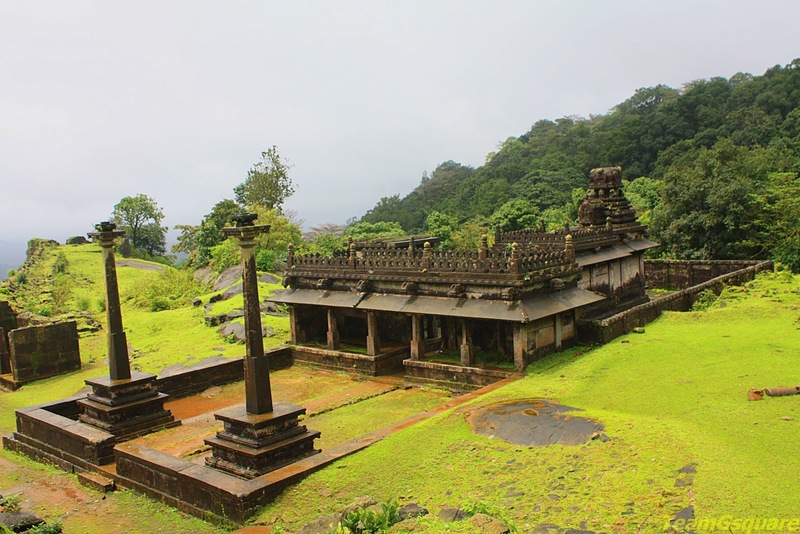 This temple is dedicated to Lord Shiva in the form of a linga and is built in typical Keladi style of architecture. Besides the temple lie remains of another structure with only pillar bases. 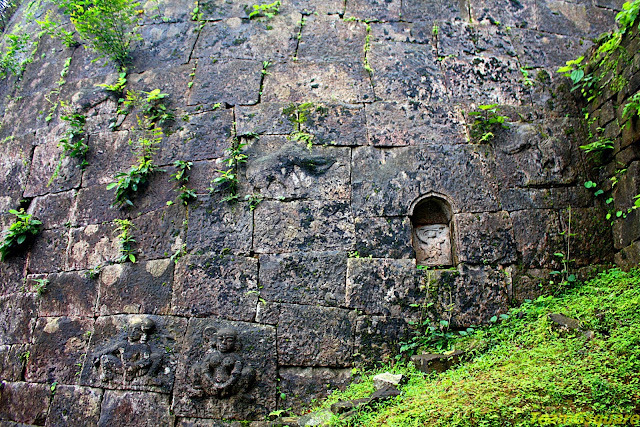 A small rock with a temple of Lakshmi Narasimha at its top is seen right opposite to this temple. A little further from this temple is the ruins of a huge palace where King Venkatappa Nayaka lived. 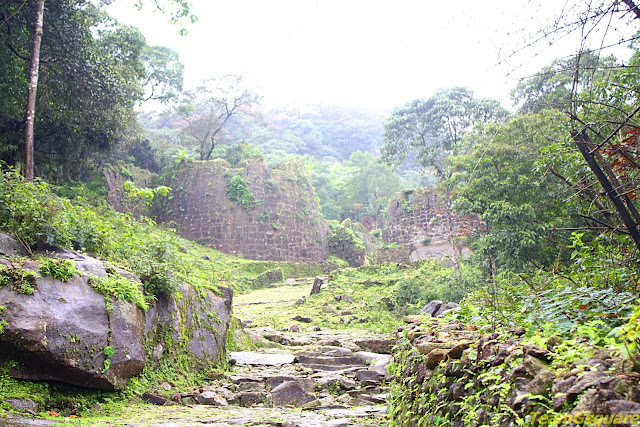 These ruins are a feast to the eyes and a sight difficult to forget. Besides this is a small yet charming queen’s bath. 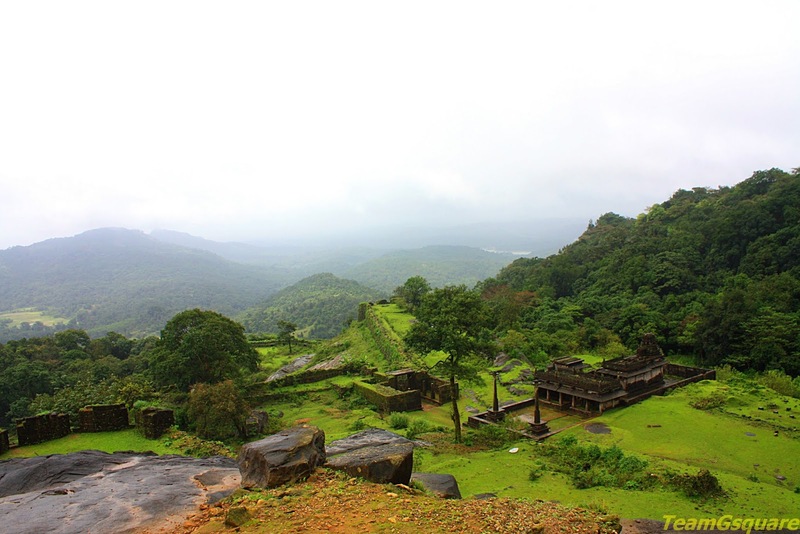 Further from here is the topmost point of the hill, with the temple of Shikhareshwara. 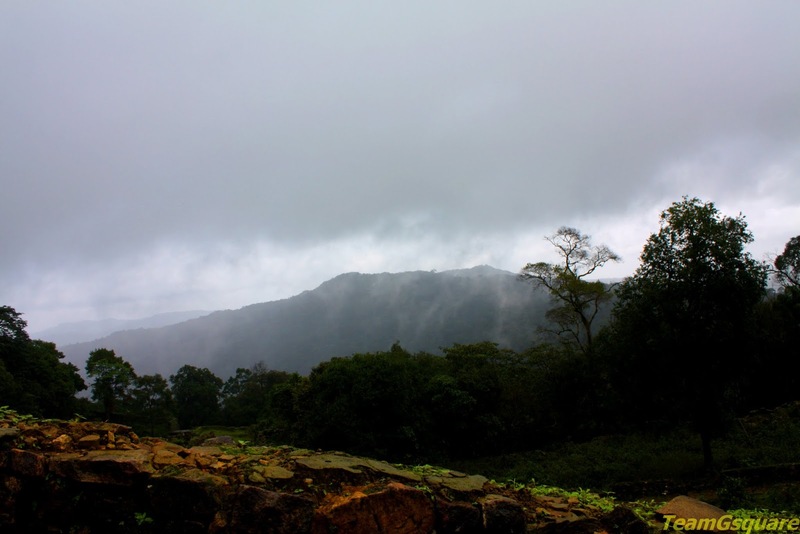 We did not trek to this spot as the rains intensified and the weather looked threatening. 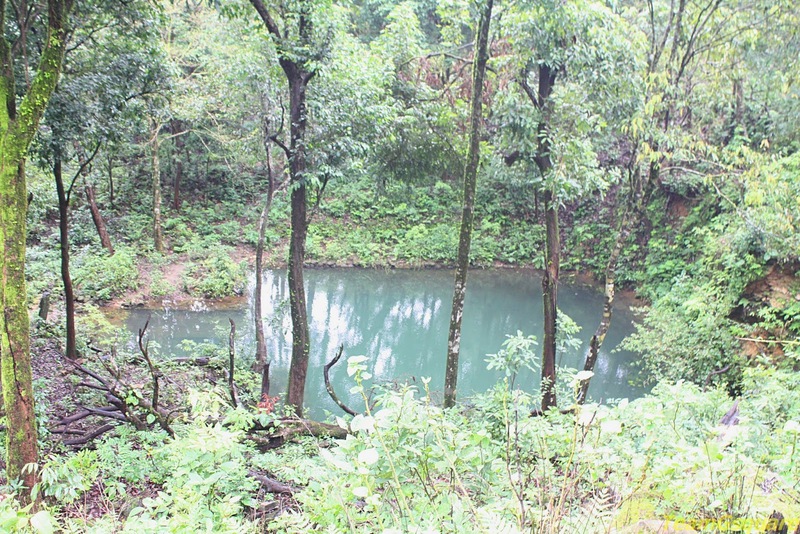 There are many water ponds which were full owing to the incessant rains and were a sight to see. The descent also was too slippery with fresh rains and drizzle every now and then. The only saving grace was that we did not have any fall or injury. 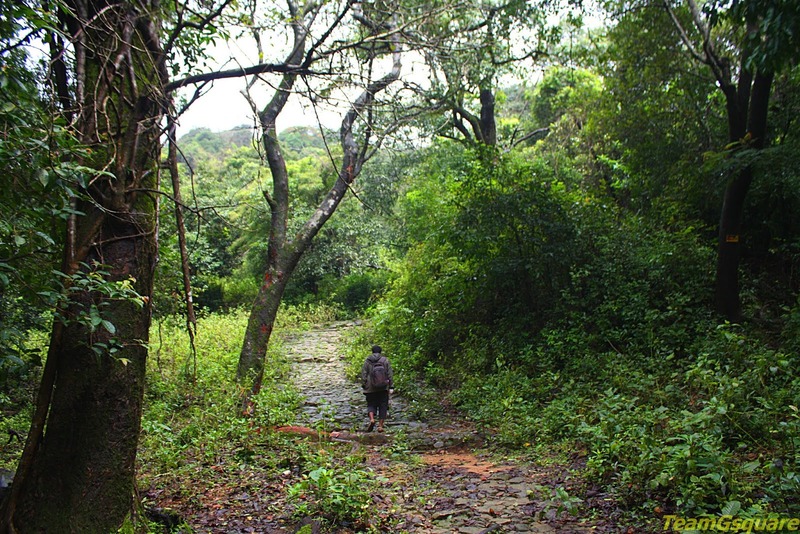 Though the trails were too slippery, we enjoyed the trek thoroughly and will always remember the enchanting views Kavaledurga offered .Overall, the trek was exciting and adventurous. 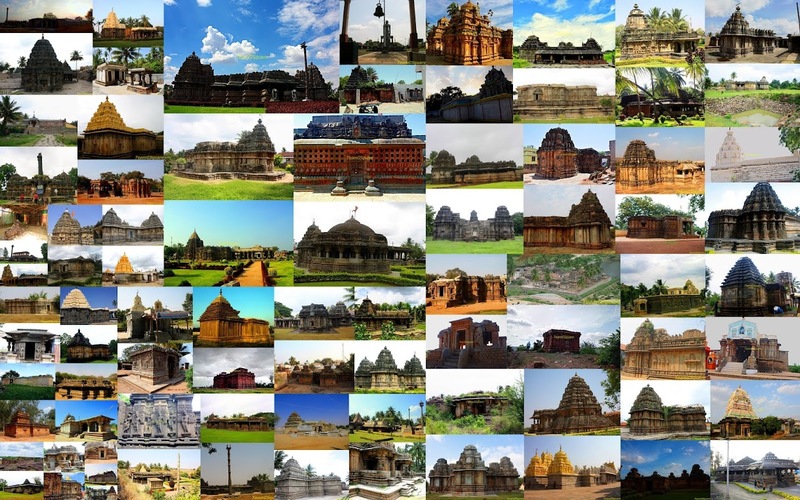 Other Places to Visit Nearby: Thirthahalli, Agumbe, Hulikal, Kolluru, Kodachadri, Nagara Fort and many more. 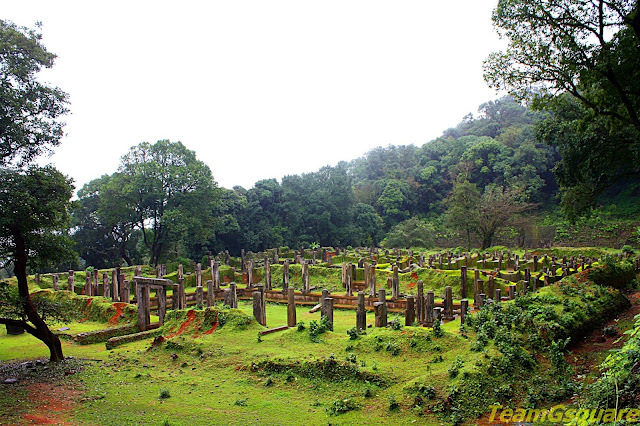 How to reach Kavaledurga Kote: Drive on Thirthahalli - Agumbe highway; Take right at about 7 km from Thirthahalli and travel for about 10 Km to Kavaledurga village. 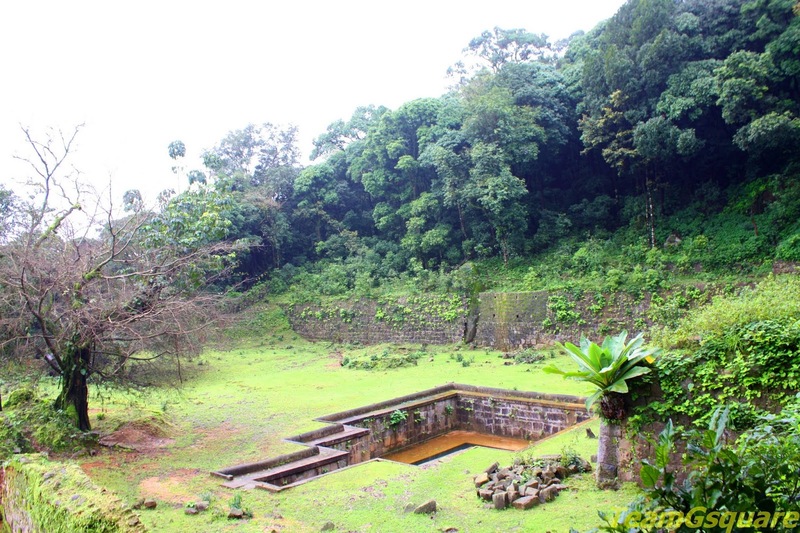 The village is located about 18 km from Thirthahalli and 350 km from Bangalore. Accommodation: There are no accommodation facilities inside the village, though one can pitch their own tents inside the fort area or in the village premises with prior permission of the villagers. However, the closest and a better option would be to stay at Thirthahalli which offers good accommodation choices. Where to eat: There are no eateries in Kavaledurga; Thirthahalli is the closest and a better option. 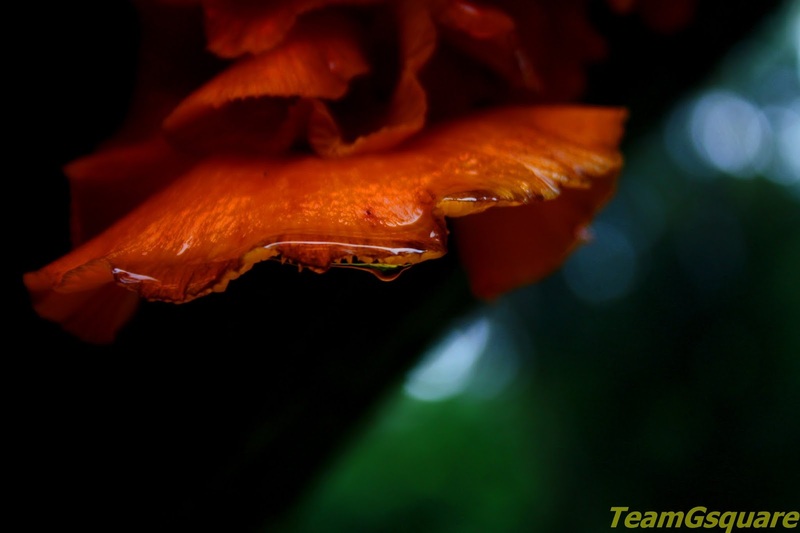 Fantastic sighting of the natures, coupled with a touch more beautiful images. Wonderful photos thanks for sharing this discovery. Amazing place. Great to read. Beautiful pics. It is a beautiful place in monsoon. The temple looks beautiful with two sthambas. how long is the walking trail..
What is the time.rewuired to climb uphill. @Soma Shekar The trek would take about an hour and a half max to reach the top. As of now permissions are not required to trek.